I don't really have much to say tonight. Perhaps I should be more precise and say I don't have much to say that would be coherent, or even interesting. So instead of a story of how hot it is or an anecdote of my children tying me up and locking me in the basement because I refused to buy anything from the ice cream truck (partially because this did not happen, yet...) For tonight I am going to cut to the chase, leaving out the long winded tale of our lives and just tell you about the sour cherry pound cake I made with the cherries that did not make it into one of the many batches of sour cherry jam. This pound cake is nothing more then a fruit substitution in the Blueberry Raspberry Kirsch Pound Cake I shared last summer. It makes 2 loaves, every time I made the blueberry and raspberry version we froze one and enjoyed the other one right away. The first time we thawed one and served it for breakfast the boys both looked at their plates and said, "Blueberries and raspberries, where did we get those? It's winter." How I love brainwashing! While I love the blueberry and raspberry version the sour cherry one is even better, there are so many more layers of flavor and balances to it. The cherries sweeten when they are baked while remaining tart enough to contrast with the sweet cake. As a total surprise, everyone here, from 5 to 43, agreed with me. This winter it will be wonderful to have both versions stored away for a taste of summer. Generously butter a 9 cup Bundt pan or two 4.5 cup/1.5 Qt loaf pans and then dust it with all purpose flour, shaking out the extra. Beat the eggs and sugar in the bowl of a stand mixer with the flat beater attachment until thick and smooth, about 1 minute. Add the kirsch and the butter in 1 Tbsp sized pieces and beat until it is thick and fluffy. This should take a couple minutes, stop once to scrape down the sides. Add the baking powder and salt and mix to combine well. Add both flours and turn the machine on and off on low in short pulses until just combined. Be careful not to overmix. 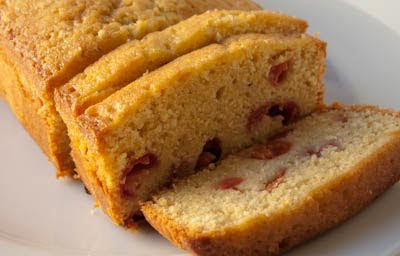 Toss the sour cherries in a large bowl with 2 Tbsp all purpose flour before using a spatula to fold them into the batter. Scrape the batter into the prepared pan or pans and smooth the top. Place in the center of a cold oven and turn the oven temperature to 300°. Bake until a knife or cake tester inserted in the center comes out clean. For both pans for me this took 1 hour and 25 minutes. Cool in the pan or pans for 5 minutes before inverting on to a cooling rack to cool completely. If you wish to freeze the cake wait until it is cooled completely and then place the cake in a freezer bag, make sure to label it. To defrost just allow to defrost overnight at room temperature. Robin, I would be very happy with a slice of your pound cake with a cup of tea. This looks delicious! 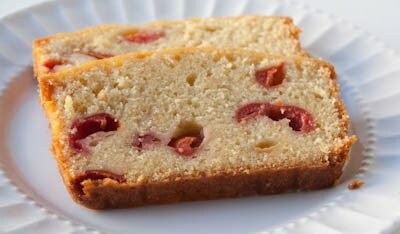 I love pound cake, but with sour cherries, it must be out of this world!